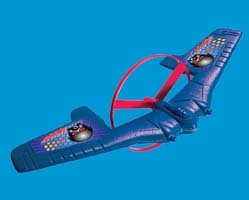 Two gliders and a launcher are included in the Rip Flyers pack. 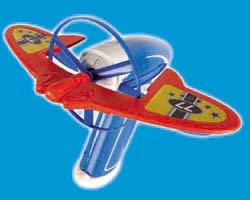 Simply attach the glider to the launcher, pull the cord and off flies the glider. This took me back to a similar toy I had as a child in the '80s. 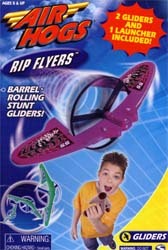 Only Air Hogs seem to have improved upon a well loved format. And thanks to the fact that two gliders are included, you don't have to launch one and then go and pick it up before launching again. Not only that, but it also means that two people can play with this together - each with their own glider. Keeping two children quiet for less than £8 is almost impossible - or it was until now. Having seen the latest range of Air Hogs pocket money priced gliders, I don't know how they manage to pack so much quality into such a low price tag. There's no way that anyone could find fault with these classic, upgraded toys which have been around, in one form or another, for years. The fact that Air Hogs have picked up on them and improved them dramatically is testament to the fact that at least one company out there believes in putting quality before making wads of cash. Now stop reading my sycophantic drivel and go and buy one of these! You won't regret it. Other stockist of this item include: Asda, John Lewis, Tesco, Toys 'R' Us and all good toy shops.